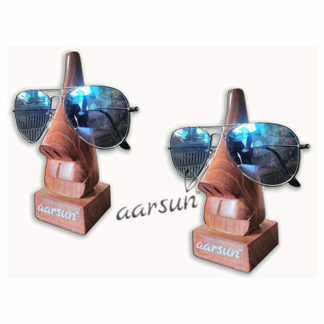 Aarsun Hand-carved Spectacles / Glasses Holder / Stand by skilled artisans made from Seasoned Sheesham Wood with premium finishing and good quality. The spectacle holder is handmade and give more traditional and antique look to your living area as well as your office.You can also use these spectacle holder as a gift for you loved ones.There is also our brand name one can see over the spectacle holder as to insure the quality of the product. As the unit is handmade so gift wrapping option is not available with this unit. One can add more than one pair of glasses on it. Size is adequate. Very useful product. Great product! Good quality. Value-for-money. A very useful and stylish way to keep reading glasses/sun glasses in a place where they’re easy to find when you need them. Recommended. Very nice product and useful for spectacles.